My first six months with the Society has been fascinating. As I’ve met with members across the UK, I’ve learned just how diverse our organisation is and how passionate our members are. I want to thank the hundreds of members that I’ve met for giving me their time, sharing their honest views and helping me identify the areas we need to improve. We all want the same thing: a vibrant and influential Society that promotes psychology and psychologists, that keeps practitioners up to date and that develops services that members value. Many of you have also given valuable feedback about the Society Review and as a result, it’s become clear that we need to widen our focus beyond just restructuring the member networks in order to achieve real and lasting change. We’ve heard loud and clear that our role as learned society is incredibly important to you, and we’ll continue to prioritise this important aspect of our work, but you’ve also told us that you want the Society to be a stronger professional body, speaking and acting on your behalf on the issues that impact on your working lives. Issues like the proposed 18 per cent increase in HCPC fees for practitioner psychologists. We believe this is unfair, and with your support, we’ll be robustly challenging this significant increase. We know that we have to deliver some tangible outcomes for you, but alongside that we also know the Society has to start working in a different way. That means changing our culture and working together in partnership with members. At the heart of this change is the determination to make the Society truly membership-led. That means giving you a much stronger voice in determining our focus as an organisation. Our inaugural Senate is a concrete example of this, with chairs of networks, divisions and groups meeting to decide on our campaigning priorities for 2019. This is an important first step as it puts our members at the heart of the decision-making process. Next month, I will be taking an initial transformation plan to the Society’s Board of Trustees, outlining the steps we need to take and the further investment we need to make in order to radically improve the Society. This is an important milestone in our transformation journey. We know that change can be difficult, that it’s constant and that it requires partnership. I know my challenge over the next year is to deliver for members so that together, we can relaunch the Society as a powerful professional body and an influential learned society. 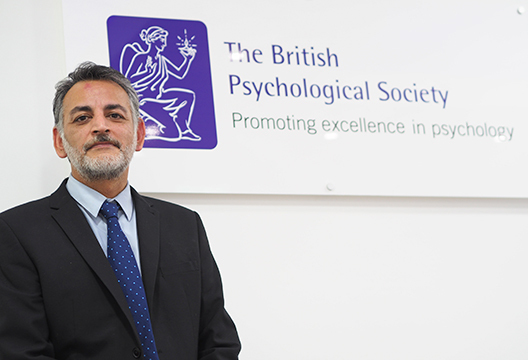 Sarb Bajwa is Chief Executive of the British Psychological Society.